Eupatorium serotinum, also known as late-flowering thoroughwort, is a fall-blooming herbaceous composite (aster family) native to North America. 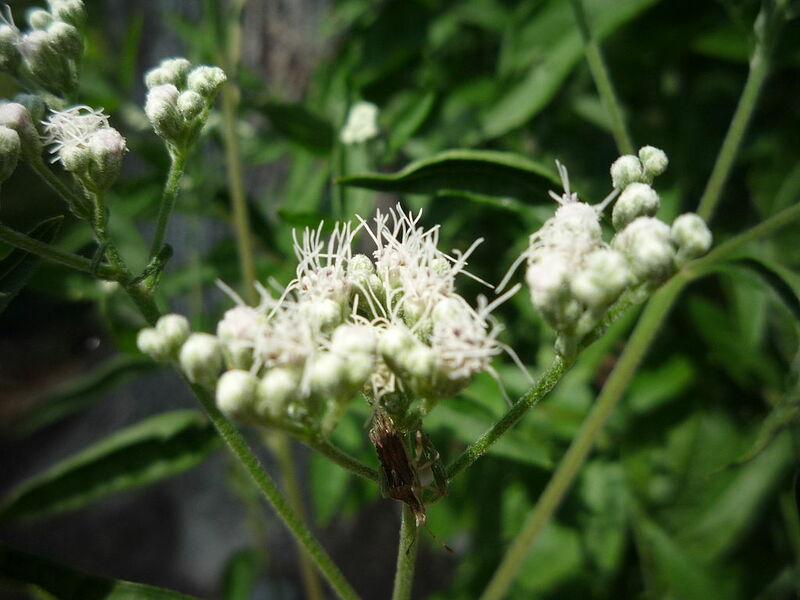 Like other members of the genus Eupatorium it has inflorescences containing a large number of white flowers with disc florets and no ray florets. A perennial plant growing from 3-6' tall, it is largely unbranched below, but forms occasional side stems toward the apex. The stems have indistinct lines of white hairs, and are generally pubescent. The leaves are primarily opposite, although the upper leaves near the inflorescence sometimes alternate. These leaves are up to 7" long and 2½" across, with petioles up to 1" long. They are lanceolate, largely hairless, with coarse serration along the margins, and there are 5 veins that diverge from the base. These leaves tend to nod downward from their petioles, and are often dark green. The flat-topped inflorescence consists of numerous heads of white disk florets; there are no ray florets. There is also a long divided style that is white, which protrudes conspicuously from each floret. The blooming period occurs during late summer or early fall and lasts about a month. There is occasionally a mild floral scent. The small achenes develop flat tufts of hair and are dispersed by the wind. The root system is fibrous and rhizomatous. This plant often forms colonies by means of these rhizomes. Cultivation: The preference is partial or full sun and moist to dry conditions. The soil should be loamy and high in organic matter. Lower leaves sometimes discolor and fall off during a drought, otherwise this plant is subject to few problems. The size of this plant is significantly affected by moisture levels. The flowers are very popular with many kinds of insects, including long-tongued bees, short-tongued bees, wasps, flies, small to medium-sized butterflies, skippers, moths, and beetles. Most of these insects seek nectar, although bees may collect pollen and beetles may feed on it. In the main photograph, are two Ailanthus Webworm Moths sucking nectar from the flowers. The caterpillars of various moths can be found feeding on various parts of this and other Bonesets, including Haploa clymene (Clymene Moth; eats foliage), Phragmatobia lineata (Lined Ruby Tiger Moth; eats foliage), Carmenta bassiformis (Eupatorium Borer Moth; bores into roots), Schinia trifascia (Three-Lined Flower Moth; eats flowers and seed capsules). Mammalian herbivores rarely consume this plant because of the bitter foliage. In overgrazed pastures, Late Boneset often becomes more common because of reduced competition from other plants.